Artist Laurel MacDonald watches her video installation titled If I Love You If You Love Me, screening as part of the Luminato Box at Sam Pollock Square, Brookfield Place. The exhibit consists of sequenced images of hands using sign language to express a universal human message of love. 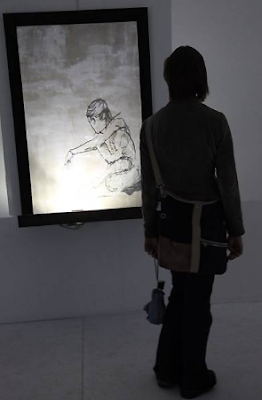 A visitor looks at one of a series of interactive media pieces titled The Shadows of Burden (Doublespeak) at Commerce Court West. Each piece, created by Studio F-Minus (Brad Hinson and Mitchell F. Chan), consists of encaustic painting on linen with bent wire and rod protruding from the surface of the artwork. Light mounted on the painting's frame is activated by a viewer's presence, creating shadows that move across the paintings. 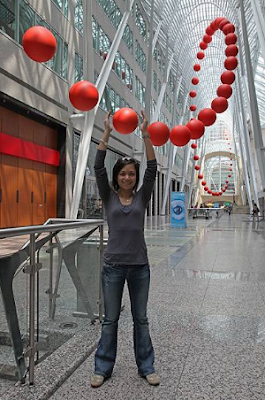 Margarita Ramos encounters the long wave art exhibit, which consists of 64 red spheres hanging from the ceiling inside the Allen Lambert Galleria in Brookfield Place. Rokeby's long wave is representative of a modified sine wave, the basic structure of modern wireless communication.